Some of our scientists have proposed sending in a research group to the devastated Eden site. Whatever destroyed Eden may be a threat to us as well. We have also confirmed our earlier suspicions. 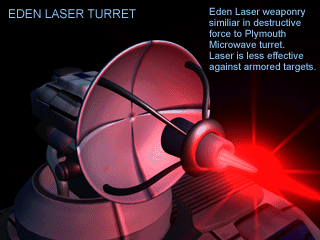 Eden was developing weapon systems. These weapons have been deployed in structures and vehicles throughout Eden. One of our scientists has modified several of the scanning devices on our Scout units. Although she declines to give us all the details until she has done “more research” she is very convinced that the data we need will be found at the Advanced Labs in Eden. She also recommends we proceed with our plan under the cover of darkness. Our units must infiltrate the colony and find the Advanced Labs. Move a Scout directly next to the side of the Lab so the Scout can scan the structure for the data. It may take the Scouts some time to locate the information and transmit it back to us. Protect them with Microwave Lynx units. The Labs have sustained heavy damage and may explode spontaneously. If that happens the data will be lost forever. We must hurry. Units we have previously sent into the colony to explore have stopped transmitting after a short time. Oddly, we can still see these units in our satellite images. Be aware of the potential loss of control of the units. Hopefully, our expedition will help answer this mystery. Check the Specific Objectives list for further information. Plymouth mission 4 uses the same map as Eden Mission 4.